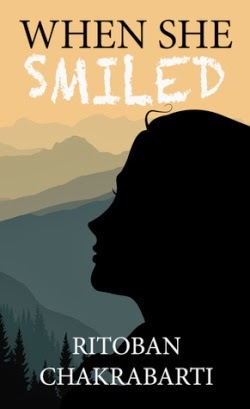 The book “When She Smiled” is a debut novel of the author. The cover attractive and title interesting. Set in the background of Shimla, well known for its picturesque beauty and the terrains. The book is written and narrated by Roy. The story is set up in the backdrop of the beautiful and mesmerizing city of Shimla. The story revolves around a fifteen year old Bengali , Mrityunjoy Roy, who has spent his ten years the hill town, enjoying the beautiful views, the first snow and the breezy lengthy walks. It is set at the time when he returns back from a Sainik school to Shimla to join DAV(where he pursued his primary education) to complete his higher secondary education. He leaves the Sainik school for he would be deemed unfit by NDA , the aftermath of an incident. From a chubby boy to well groomed teenager, Roy is excited to go to his school and meet his old friends. He is raised in a family which is academics oriented. He being the youngest of the siblings, had to achieve a high benchmark set by his siblings Ashima and Sid. He has a strict father whose temper when bad could turn from verbal to physical,which have resulted in serious injuries in the past. He likes to participate in all the competitions and has a goal of pursing engineering in one of the IITs. His not so complicated life is turned up side down when he first sees Akansha in the physics tuition. Akansha , the prettiest girl in the class with a captivating pair of eyes and a beautiful smile. She seemed out of league for he had competition, but she grows closer and he is happy with his achievement. Studies takes a backseat and day dreaming a regular affair. Walks and talks after the tuition becomes a routine. An incident changes things between them. She no longer smiles at him or behaves in the same fashion, in turn becomes sarcastic.Furthermore, the death of his pillar, his sister completely shakes him off. The story continues as of how the smile lighted his path to success. The author beautifully brings out the city of Shimla and had made justice to the magical land. The poetry by Roy a saving grace of the book. The emotions between the siblings were portrayed out very well. The student life brought out very nicely, the struggles and training to get into a good engineering college. Coping up with the main subjects and at the same time making time for extra-curricular activities. Language simple and easy to read. The book is slow paced and not engrossing. The emotions of love not brought out well. Overall, the book is an average read. A one time read. If you are a nature lover and want to reminisce your life as a teenager in school then this is the book.